Last September we revealed that Roxette are set to play at Globen in Stockholm this summer (August 2012) on the special anniversary corporate event organized by the Swedish company Oriflame. In the beginning of May this year it turned out that Russian edition of “Travelling” does not include the very first international single “It’s possible” in both versions. You may ask how those two things go together? 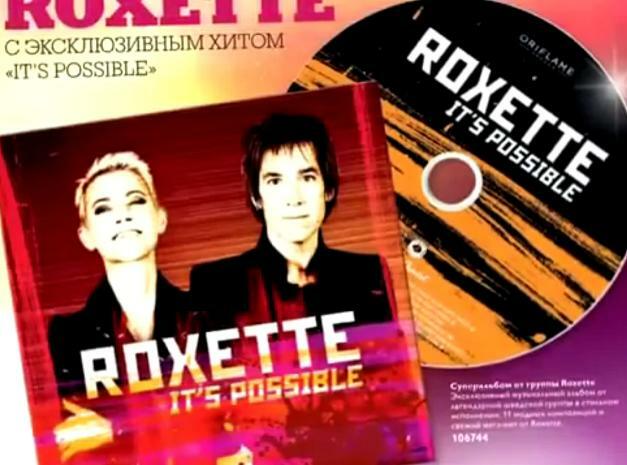 Well, it turns out that Russian chapter of Oriflame claims that Roxette have written a special song for them. What’s its name? Yes, you’re right – “It’s possible”! In the end of May the 9th edition of the Oriflame magazine will be released together with a special bonus CD – including 11 Roxette hits and a new track called “It’s possible”. At this point we only know this will be released in Russia and will cost 99 rubles (ca USD 3.5). The artwork for both the cover and CD discs is shown above this text. Thanks to Evgeny Perekopskiy for sharing this news. It’s a little bit of shame that Russians fans were fooled with incomplete Travelling…. :/ Where they can find Version Two? Of course it’s included in iTunes version of CS, but in lossy format. On CD it should be in lossless.